Fun/literary/nerdy: A map/pictorial-of-what's-there-now of locations in Albany mentioned in William Kennedy's Ironweed, as compiled by artist Dorothy Gambrell at her Very Small Array site. That's a small clip on the right. The novel is set during the Depression, so the walk through (streetview through?) 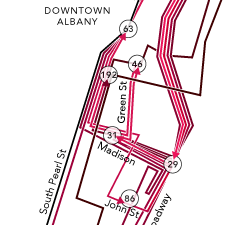 makes use of this 1877 (and pre-787) overlay of Albany streets. I love you, All Over Albany.